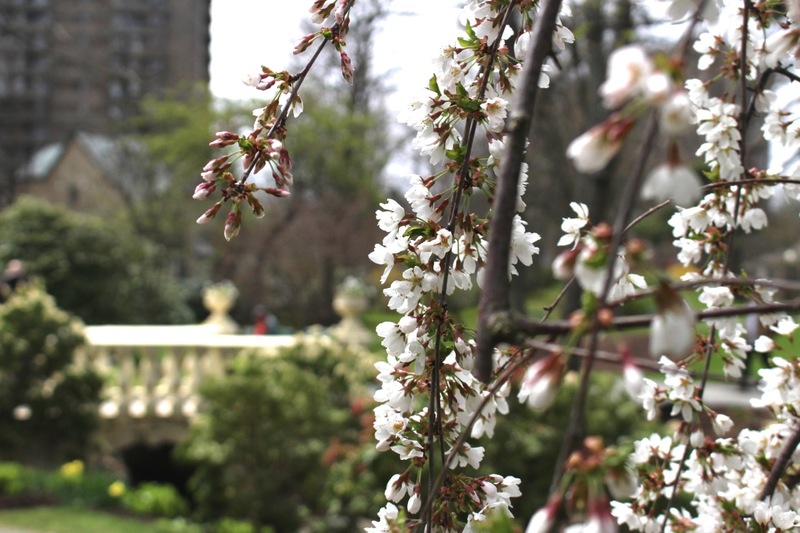 It was a brutal winter and it seems reluctant to let go and make way for spring. The day after I arrived home I rushed to the nursery (jet lag be damned) to stock up on plants before the long weekend rush, only to find that the plants hadn’t arrived yet. I know this Victoria Day weekend was early but shishhhhh. Things at the Gardens are happening much slower than in the past few years (no surprise there). So plant-wise, things aren’t very interesting. Fortunately the horticultural shortcomings have been superseded by the cultural highlights. 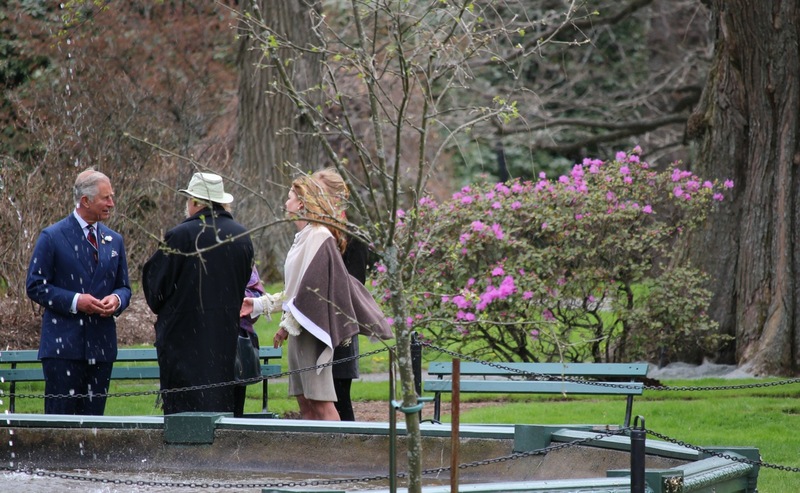 HRH the Price of Wales thrilled the crowds by plunging into their midst during his visit to the Gardens. He arrived to plant a Quercus (Oak tree) next to the one planted by his grandfather King George VI in 1939. Yours truly was thrilled to be invited to meet HRH. The rain held off and four members of The Friends board had a private (albeit brief) ‘audience’. Watching HRH work the crowds made me respect what a tough job He and the rest of the Royal family have. 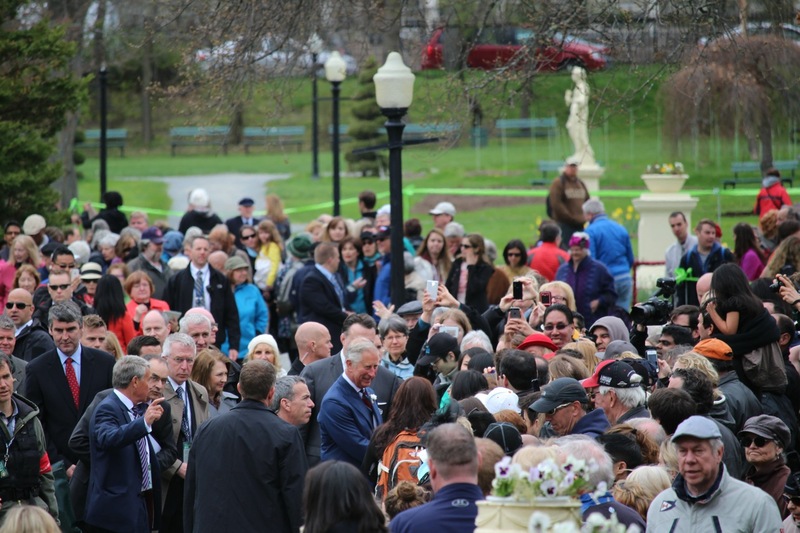 The Royal couple spent the day running around Halifax, meeting thousands of people. When do they eat? Don’t they experience jet lag? I’m still feeling the effects days after arriving home. In honour of HRH, Clary Peters (the keeper and renovator of the Titanic), launched the newly restored Titanic model in time for the Royal visit. He also brought along a couple of other model ships and got to chat with HRH. It’s lovely to see the Titanic back. She looks wonderful Clary… Thank You! 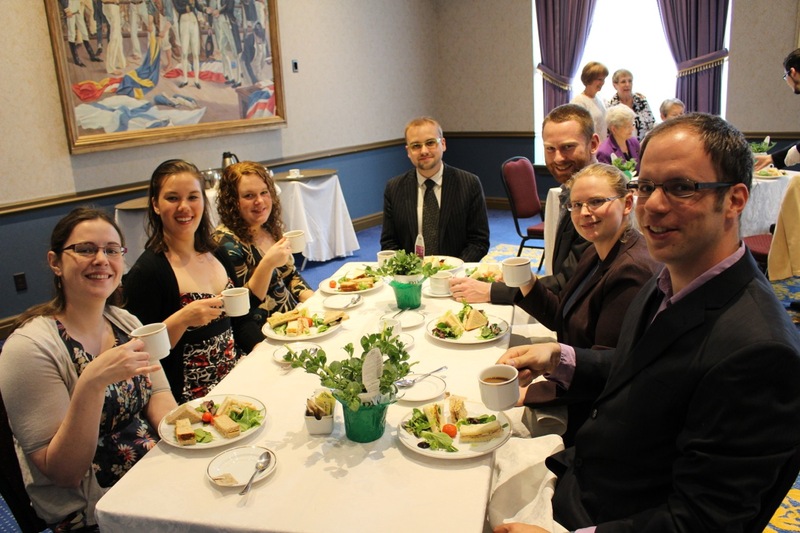 Fortunately the Victoria Day Tea Party was being held at the Lord Nelson Hotel (our generous repeat sponsor). We dashed over to join the other volunteers in welcoming our guests, many of whom had been at the Gardens and had the opportunity to meet the Prince. 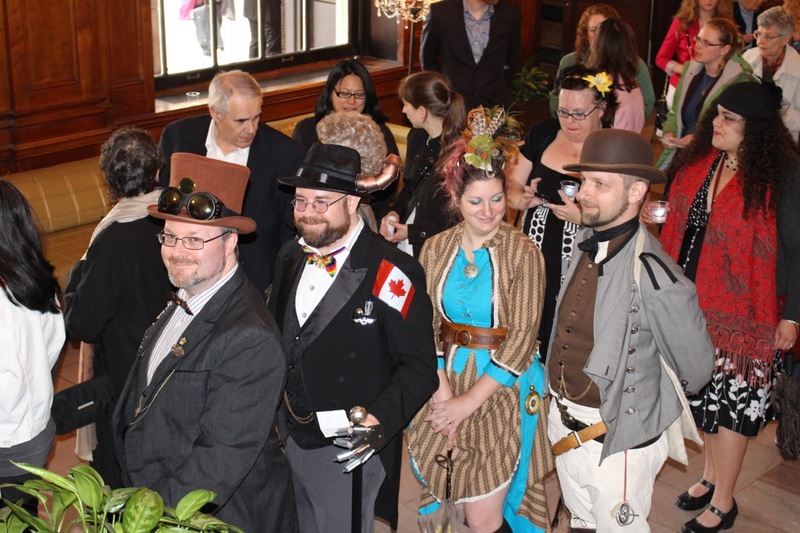 Members of the Jules Verne Phantastical Society went the extra mile and dressed for both occasions. 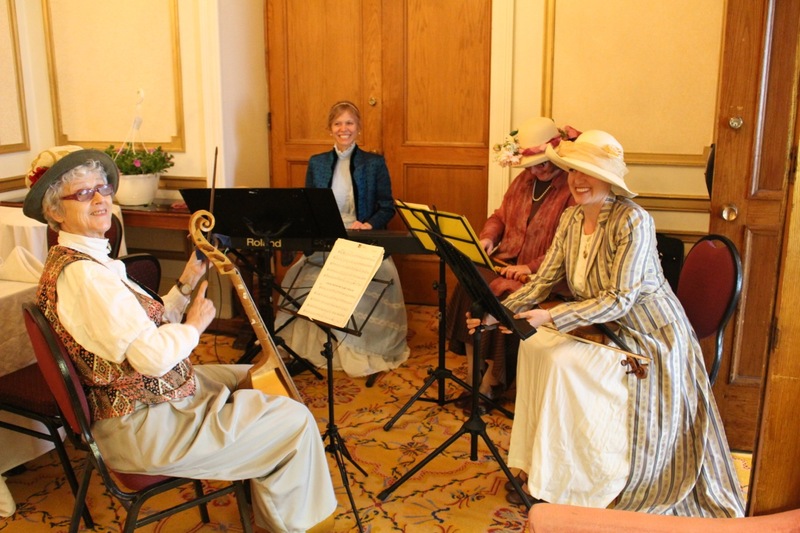 Others who went the extra mile were Hausmusik, who serenaded us in period costume. Their music is always a highlight of our tea (and our Holidays Celebration). Our fellow board member Sophie (sans hat for the moment), had a busy day preparing the venue, meeting HRH then entertaining the guests. Thank you Sophie and Hausmusik! All the comments we received were VERY positive. The food, the music, the venue… it all contributed to a wonderful event. The Tea was sold out for the second year in a row. It was lovely seeing such a diverse group. 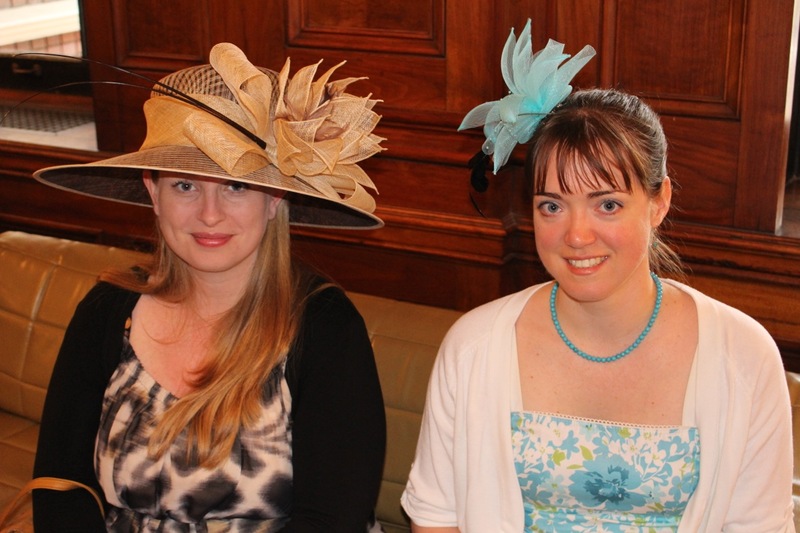 And the hats were quite lovely as well. The one on the left has even been to the Queen’s garden party at Buckingham Palace! 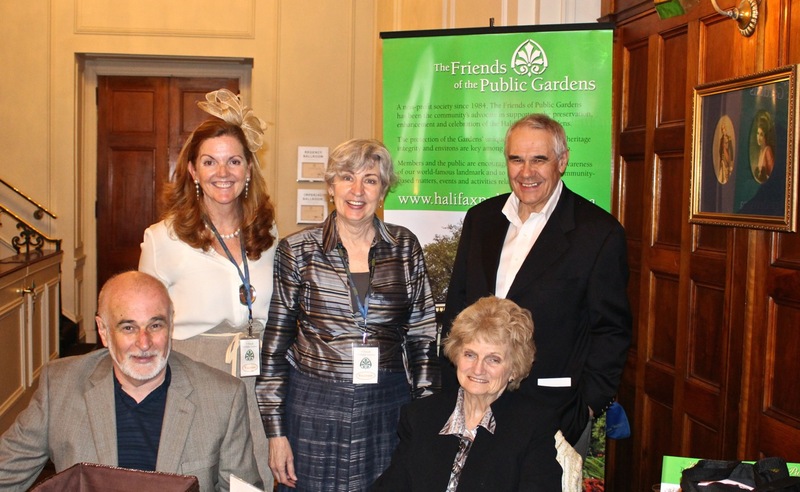 Brought to you by… some of the board members of The Friends of the Public Gardens and Victoria Day Tea Party organizers, bask in the success of an all around wonderful day. OK so horticulturally it wasn’t a dead loss. Things are beginning to look up and I suspect that after the expected sunny warm weather forecasted for the rest of the week, the Gardens will be bursting forth. Our latest tree addition a Weeping Prunus (Cherry tree) was putting on a beautiful (though petite) display. It is likely the compact, slow-growing Prunus ‘Snofozam’ and if so it will have beautiful red foliage in fall. Stay tuned! Culturally we’re not done yet either. This coming Monday, June 2nd mark the beginning of the Provincial Gardening Week (they don’t want to be outdone by Canada’s Garden Days a week later). TFPG in partnership with the Rhododendron Society are featuring a lecture by the curator of the Denver Botanical Garden. Click on the photo above for further details. I’m back, the Gardens are up and running and I promise to be more punctual than I’ve been since November (I used to be really good). In case you’ve forgotten I post every two weeks. If you’re really mad at me you can always vote me off the board. You’ll get the opportunity on June 21st during our AGM. 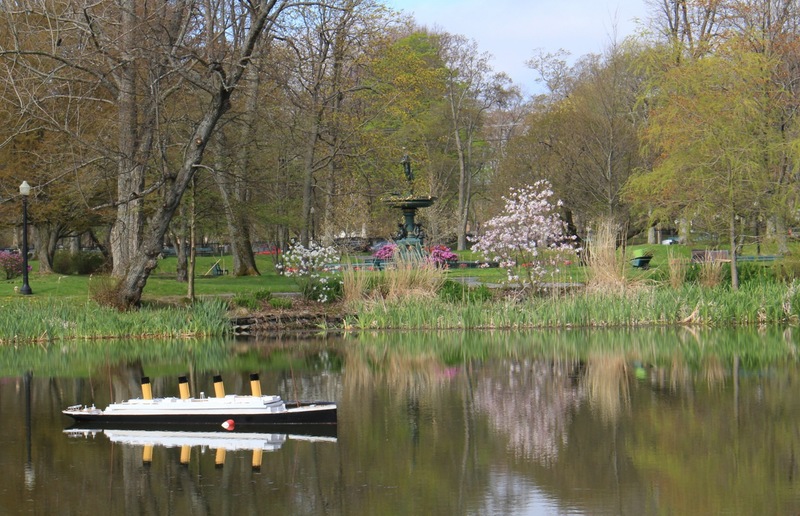 You’ll also get the chance to get the inside scoop from the ‘boss’ about what is planned for our beloved Public Gardens. Until then… go out and enjoy the sunshine. It has arrived! All copy and images (except for poster) copyright © Serena Graham-Dwyer, 2014. If you wish to use any part or whole of an image, in any manner, please contact us. 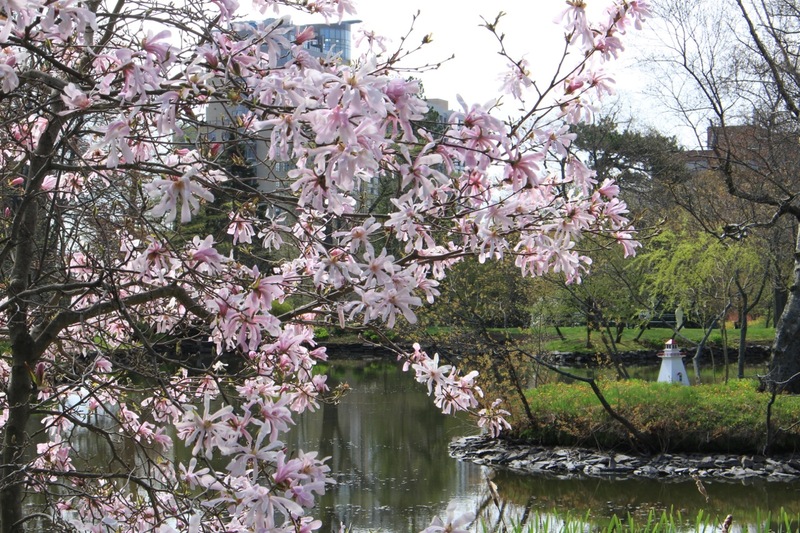 This entry was posted in Halifax Public Gardens, photo tour, Special Event, Spring and tagged Halifax public gardens, HRH the Prince of Wales, quercus, Victoria Day Tea Party by friendsblog5665. Bookmark the permalink. Lovely post as usual, especially the unique pic of HRH with TFPG. One correction though: Monday is June 2, not June 1 (see Jarvis lecture poster).